Authorities believe 13-year-old Jayme Closs was taken from her home near Barron on Oct. 15. Deputies found the home's door kicked in and her parents shot to death. NBC 5's Marion Brooks has the latest updates on the search for Jayme Closs, the Wisconsin girl missing after her parents were murdered. Authorities said Monday that they're looking for two cars in connection with the disappearance of a Wisconsin girl whose parents were gunned down last week. Barron County Sheriff Chris Fitzgerald said during a news conference that investigators are looking for a red or orange Dodge Challenger and a black Ford Edge or black Acura MDX that may have been traveling near the Closs family's home on the night that James and Denise Closs were killed and their 13-year-old daughter, Jayme, disappeared. He said he didn't have information on the cars' license plates. State, local and federal investigators have been searching for Jayme since around 1 a.m. on Oct. 15. Deputies responding to a 911 call early that morning discovered that someone had broken into the family's home near Barron, about 80 miles northeast of Minneapolis, and gunned down the couple. They believe Jayme, who is not a suspect in her parents' deaths, was abducted. Also Monday, the sheriff called for 2,000 volunteers to help in a ground search set to start Tuesday morning. A search involving 100 volunteers combed the area near the family's home on Thursday but found nothing. Fitzgerald said investigators have received more than 1,300 tips and have closed 1,100 of them. Some of the tips led to the decision to resume the ground search, he said, though he declined to elaborate. 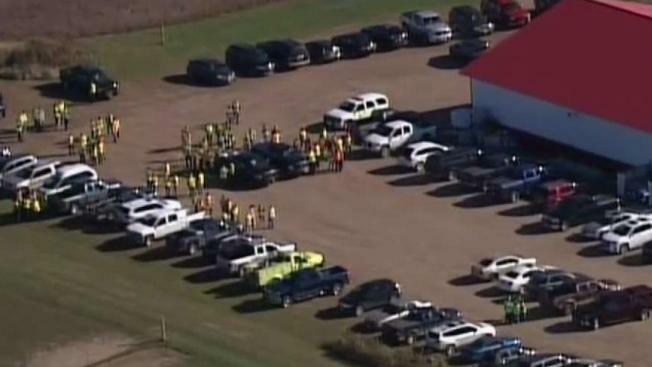 A sheriff's deputy and agents from the state Department of Justice and the FBI mapped the area by helicopter Monday afternoon in preparation for Tuesday's search. "We've determined we'd like to search a bigger search area based on information our investigators have collected," Fitzgerald said. "These tips have led us to this." Jayme's classmates planned to hold a vigil for her Monday evening at the Barron High School football stadium.